The changing of the seasons often evoke a stirring in my soul that is measurable. It is like the heart to keep time as the days pass and the clock of mother nature shifts in the telling. And I have been thinking of the historians of antiquity, the scholars of Truth and otherwise, that recorded the telling and the kept stories for us to learn from. And I am pondering the lessons that the seasons teach us. We can always benefit from the teaching in His Word, that is a given. There is a thread of grace that is woven through scripture that leaves us always longing to see more of the tapestry He has created in the frame of forever where His Word exists. 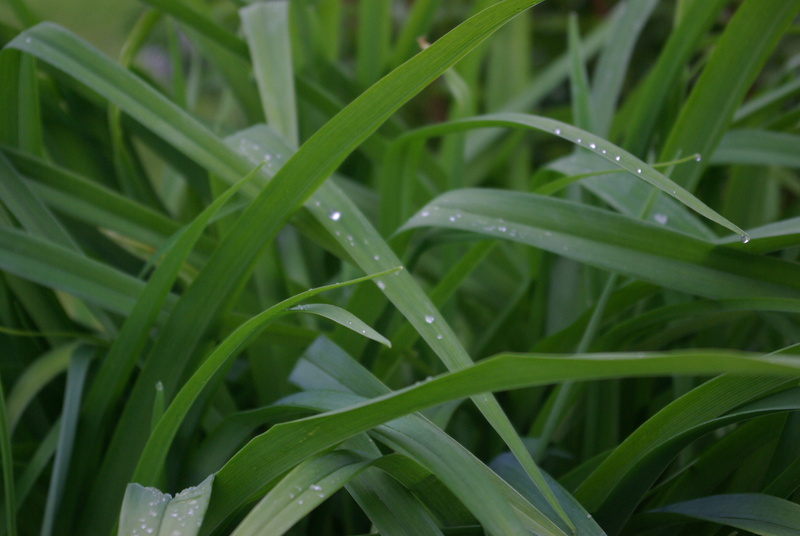 But with the emergence of the warmer temperatures, the grass which is absorbing the light waves more each day reveal the chartreuse blades becoming emerald jewels with morning dew. And the bird song that bursts upon the breaking of the dawn that alights a heart as one pauses to take in the splendor. And I wonder what it must be like to see heaven’s sunrise each day. Each new perspective gained from the lesson teaches us to see Him more. Living here in the Midwest, I think we get a small sample of that Shekinah Glory which basks on the songs heralded by angel choirs with each new day. Just the awareness of the new life that is blooming all around is enough to let the weights fall off the shoulder and the stress to dissipate into a prayer of thanksgiving for the chance to experience His grace in all our daily beginnings. It is because of these truths that we are called to know Him more. We are able to take in His Word, like vitamins for our soul, every single day and reap their powerful effect on our existence. He sends us these reminders regularly. His Word, so full, so deep, so good. It never fails to amaze me of the intricacies of God’s precious Truth…and how His World testifies of Him, too. I am astounded when people deny His existence. But there are days I forget to be amazed by all that is before me. I forget to stand in awe, because it is all miracle if we let ourselves see through His lens of grace. Yet His handiwork is clearly displayed…effortlessly. I am humbled at the patience He has for us, the love His beauty displays, the careful way He unwraps His goodness with intention. And this grace thing, it is there. Stamped all throughout the living epistle of love that we read and we hide in our hearts. It is evidenced as we watch the world unfold the hidden beauty that has been slumbering through the cold dark days waiting for the warmth of the sun to melt away the cocoons that have crystallized through winter’s solemn waiting. 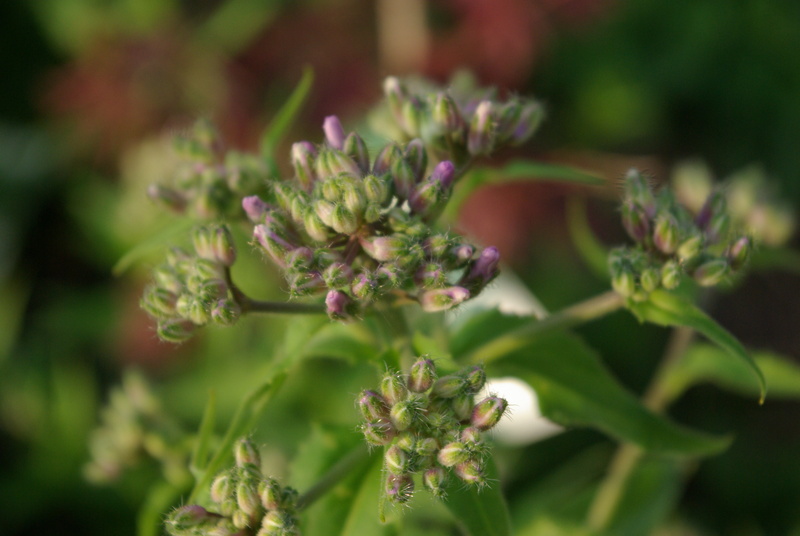 Spring literally sings of rebirth and hope and expectation, and as we move into the explosion of summer… buds bloom and an echo of praise sounds forth. Even the rocks cry out in wonder at the fullness of God. I am moved to silent reverence as I consider the art of walking in humility. 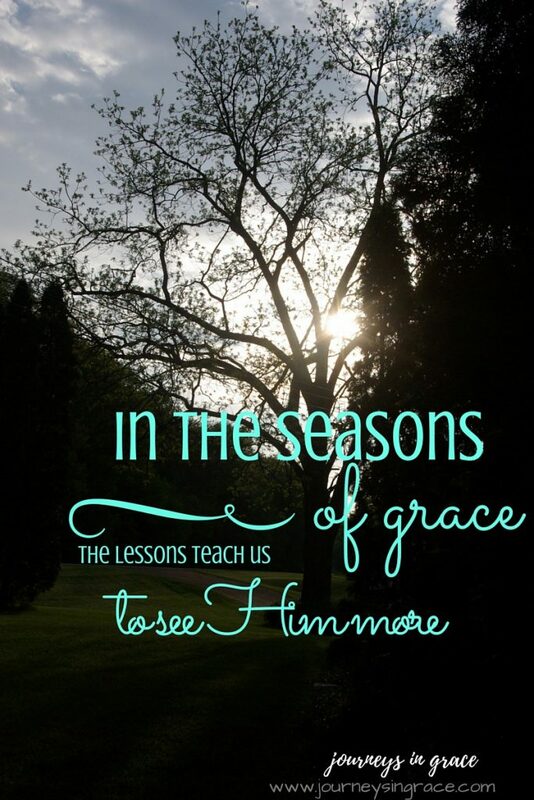 Lessons in the Seasons of Grace are playing out right in front of us. 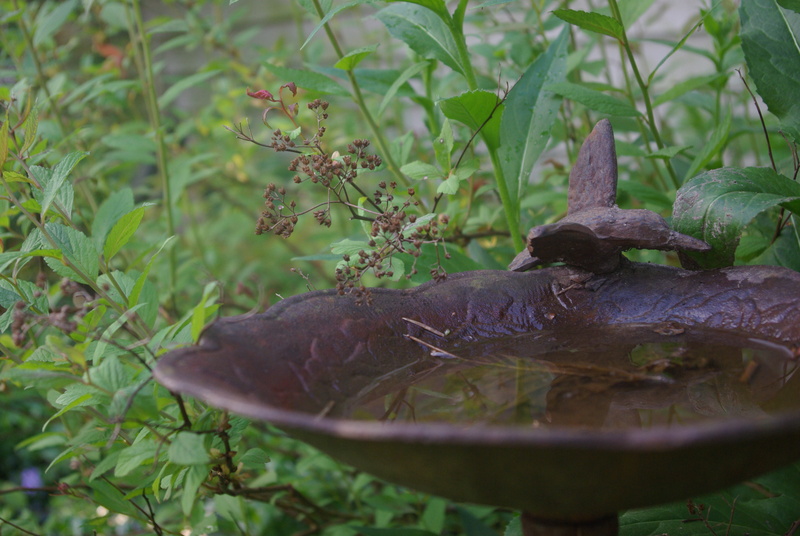 Through the lesson of the season, a revelation emerged while I watched the birds move in tandem about their daily working, always in pairs and sometimes in triplicate. They needed no one to tell them what to do, because they were hardwired to be a bird…to be themselves, inherently cared for by the Creator. I envy that freedom. Just to be simply me; a paradox I am learning to let settle upon my soul. To let weight of that capture close. 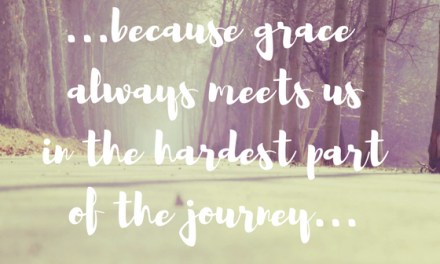 To be His… it is a grace gift. It’s a gift He gives us as he romances our hearts with the truths of His Word and the gentle nudge of His Spirit within. The love that He sheds abroad, blazing our hearts with the Holy Spirit, sweeping close and hedging in shatters the shackles that keeps us chained to the unbreakable walls we build. But did you know that your name is engraved on His hand and your walls are ever before His face? 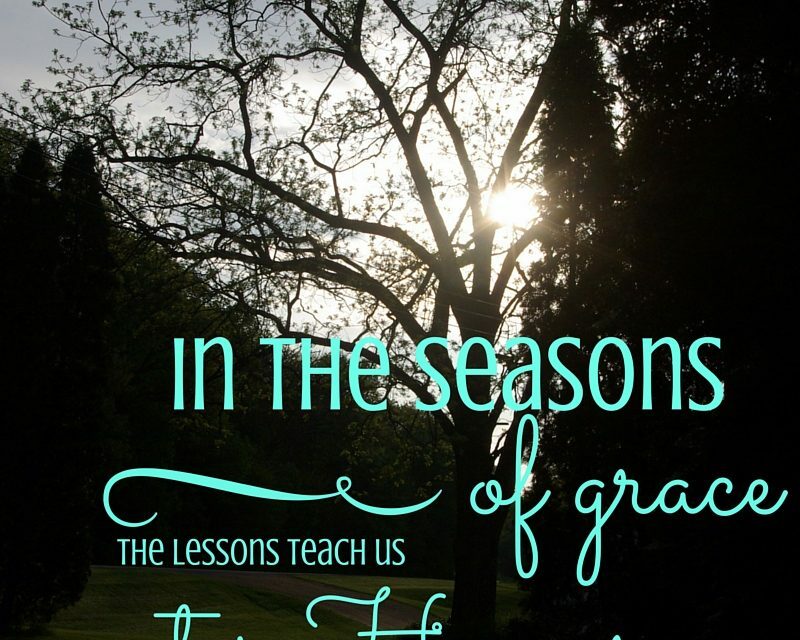 (Isaiah 49:16) And because of grace there is a changing that takes place with every season. As we grow through these lessons, we are left altered. Like Creation, it should be evident that the invisible nature and attributes, which are His eternal power and divinity within us, are clearly discernible to others. He gives us the gentle push that spending time in concentrated waiting provides. We lose the need to be right when we recognize we don’t deserve grace, yet it is still offered. He gives us the expansive ocean of hope that the walking by faith leads us into. We partake of the great exchange of mercy for brokenness and promise in the vast new morning’s possibility. He gives us the freedom to choose good, to love others, to live humbly that the ‘letting go’ precedes. We become those who are known not by our own measure but by the abundance of His pouring out of us. In a moment, the twinkling of an eye, our demeanor changes and we see through a lens that has been veiled by grace. We see things through love’s perspective and our praise is unfiltered, because we simply lift holy hands with nothing else required. We lean into the soul-filling love that can captivate our being, if we let it. Let us therefore come boldly to the throne of grace to receive mercy and well-timed help in our time of need.-Hebrews 4:16. He invites us to come into this place of grandeur and grace every single day. Time with Him. It is the answer to our every need; and the awe-inspiring solution to our sorrows and our hurts. He leads through the seasons of humility and mercy; sowing and reaping and waiting and resting while new life explodes in blossom. Humility is the door to God in the Seasons of Grace we live. I find myself inspired and blessed as I watch Him working. He is changing my heart daily. Sometimes the change seems imperceptible, but when I miss a step and he reels me back in grace, I am humbled and overwhelmed by his gentle guiding. The change is gauged by my response to his nudge. Humility, lessons, and grace seem to go hand in hand. This week, especially, I have learned a few lessons in the art of a humbled heart. In return He has opened up a bounty of blessing as He reminds me of the capacity of His love for the broken and contrite heart. Grace changes our perspective so that when we look a situation for a second or a third time, we see it in a completely different light…. His. He gives grace to the humble, mercy for each new day, and redemption with our confessions. He gives us seasons to teach us the parables of life that reach us where we are, so that we can be discerners of grace and willingly distribute our treasure to others. How have you learned to count grace in your seasons of life? Share your stories in the comments section of the post or leave a photo of your grace moment on Instagram @ #GraceMoments and tag me in the comment so I can encourage you. Praying for you to be inspired and to be encouraged by the invitation to sit and rest at His feet and watch as He unfolds the glory He has been waiting to display before you. 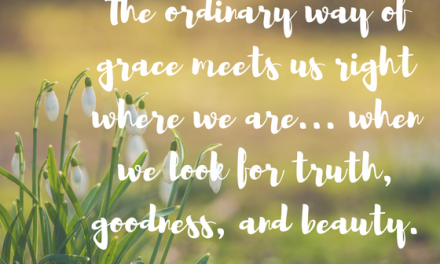 For the days when grace seems far away…. Count. Beautiful, Dawn! I spent so much of my life smothered by fear that for me God’s grace shows up every day in the beauty of living free of fear confident I can trust Him in all things. His faithful love overwhelms me. What a beautiful piece, Dawn. I am inspired. I especially enjoyed this little nugget of truth, ” Time with Him. It is the answer to our every need; and the awe-inspiring solution to our sorrows and our hurts.” Amen! Loved that, Dawn. Loved this entire post. Love you and the words you share! Pick a date in early June. I am anxious to spend time with you. The season I am currently going through is readjusting to my little gift who is this ever growing ever changing sometimes very exhausting 22 month old little girl. It is a season of change but it is a season that God continues to shower His grace on me even though I feel more like a failure. But this challenged me to see her as a unique season of grace to learn how to love and to be still in who God has made her to be. To stop fighting against her but embracing who she is becoming.